The anniversary model "30 Years 911"
If one summarizes the Porsche 911 to 1973 and 1974 to 1989 simplifying as the first stages of development of Porsche 911, then the Porsche 964 led one of the most charismatic sports cars of our time as the third stage of development in the modern era. 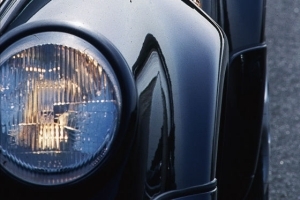 Not only technically, but also regarding manufacturing and distribution, Porsche had entered new territory with the model 964. The key word model diversification, an old hat today as basic exercise of the automobile manager, was applied with this model for the first time. 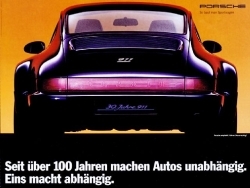 In front of this background and the fact that the successor 993 waited (almost developed) for his introduction on the market, the celebration of 30 jubilees of the sports-car icon Porsche 911 approached. A special model was planned which should be unique concerning equipment and appearance. A renewed milestone in the history of Porsche 911 and a valued memory to the past 30 years. Due to the spectacular appearance, best experiences with the acceptance of the customers and enough available capacities, it was certain, that the special model should be manufactured in the Turbo-Look with option M491. Traditionally this option, beside the car body, also contained the suspensions and the brake assembly of the Turbo. In addition to an individual colour scheme, an extended full leather interior and an increase in factory output to 3.8 litres without an increase in cubic capacity were also planned. This was therefore a "small" solution, which included machined cylinder heads and an adaptation of the control unit and increased the rated output of the engine to 270 hp. The four-wheel drive should complete the whole package as an other unique selling proposition. The customer service report pointed out how far this beginning was already considered. As an official document it referred to the standard chassis and the brake assembly of the turbo, which should belong, as with Turbo-Look vehicles of the past always did, to the full equipment package of the anniversary model. From today's point of view the plans of the development department to the 30. Birthday came at the wrong time. After a once more expected record loss in the model year 1993, Zuffenhausen was close to the heart of the darkness. The rumors about the loss of the independence of Porsche did not want to stop. In summary it was such a costly project surrounded by world economy crises and utilization emergency. Despite of staff reduction and a manufacturing order for Mercedes, (500E-manufacturing) no one had the courage to enforce the plans before the executive committee and staff. After the expense account was made, it became clear that the jubilee model was never realizable with the planned equipment package. Due to the circumstances the plans were rejected and adapted to given conditions. The planned increase in output with cubic capacity enlargement to 3.8 liters was rejected immediately. The Turbo-Look (M491) was new interpreted and converted into the option "Wide-Body". This is not meant ironically. It corresponds to the official naming Porsche used exclusively with this model! Turbo suspensions and brake assembly were not installed and actually became a standard Carrera 4 simply widened and provided with few, technically necessary parts of the Turbo. Of the proposed standard advanced full leather interior only remained the leather-covered steering wheel with air bag, a leathered block to accommodate the limitation badge and some unique details. 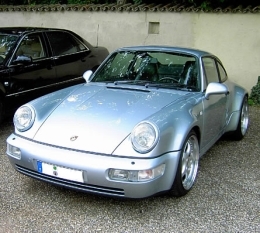 Tragically from today's view, because already with and by the successor 993 the low was for Porsche strode through, and what for the jubilee model "30 years 911" was planned could be realized for the 993 Carreras 4S and was sold more than successfully. Then in March, 1993 finally the time had come. Porsche presented at the Geneva Motor Show, the anniversary model "30 years 911" even without separate M-code, but as usual with exhibition vehicles, with affectionately full special equipment. By the onset of mass production the awarded option code of the special model at Porsche was "M096". Officially a limited edition of only 911 pieces worldwide was communicated and produced. Every car should become with individual numbering a unique piece and should be offered to all RoW markets, so not in North America. However, it did not come to a continuous numbering. How and when each car was given its limitation number is unclear and based on the available documents only speculatively explicably. Some numbers were probably not assigned, because obviously not every anniversary model "30 years 911" could be sold, probably because many potential buyers taste did not match with the most popular in the '90s, but ultimately not suitable for mass-coloring Viola Metallic and compatible Rubicon-gray colored leather interior. From the Porsche delivery centers in all countries, suddenly came the cry for help – other colors must be possible, in order to have success with this model. The official delivery area was extended quickly to Polar-Silver Metallic and Amethyst Perlcolor, while the silver version was planned from the outset for certain markets, and probably first used for No.009. 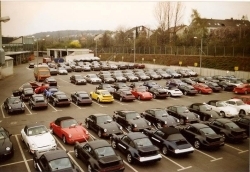 But even if such an option was never officially resigned in a catalog or price list, about 200 individually painted and individually equipped Carrera 4 Turbo-Look Coupé (without M096) give a prove, that Porsche listened to the wishes of the customers and the dealers, even if for these cars, up to two known exceptions, neither the option code M096 nor a limiting plaque was provided. Up to individual equipment details the anniversary model “30 years 911” is identically constructed with the Carrera 4 Turbo-Look Coupés (without M096). The total production amounted for RoW at the end of the construction period are 1085 copies. 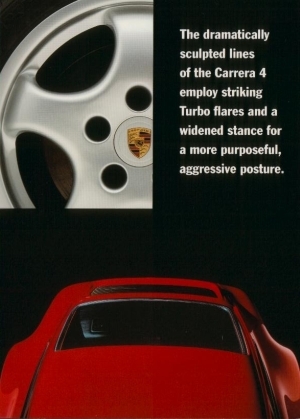 Including the in model year 1994 introduced Carrera 4 Wide-Body for North America, the total number of items of all Carrera 4 Turbo-Look coupés amounts on 1352 cars. 964151 as regular-drive (RHD): 60 pieces anniversary model “30 years 911” and three Carrera 4 Turbo-Look Coupés (without M096). Both variants were build up for model year 1993 (P-series) and 1994 (R-series), as well as 964150 for the U.S.-counterpart: 267 pieces C4 Wide-Body, only for model year 1994 (R-series). The interested reader will ask himself: Why at least? Since not all of the anniversary models "30 years 911" and the equivalent Carrera 4 Turbo-Look Coupé (without M096) are shown and documented in reality and probably never will be, only the official Porsche agenda remains for determination. At least two anniversary models “30 years 911” without the option code M096 are documented binding. It is number 002 and still owned by former German motorcycle racing driver Dirk Raudis. No. 001, represents the second copy of such as well and was also exhibited at the Paris Salon 1993, it was rediscovered in Belgium 2011. The JUBI REGISTER deals with the anniversary models "30 years 911" specified and completely. 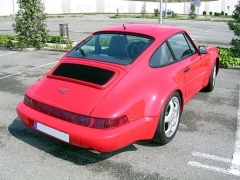 Consequently the Turbo-Look Register does not list this model and limits itself to the Carrera 4 Turbo-look coupés (without M096) and the counterpart for North America, Carrera 4 Wide-Body. 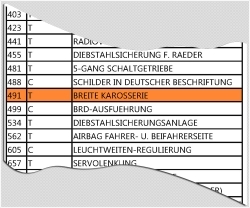 The original price for the base version of both variations amounted in Germany: 145.900,- DM (Source: Porsche Pricelist MY. 1994 - 01.08.1993, WVK 140 411) However, many cars were also individualized and revalued here. Thus the information is not to be confusing, we want to start with further unpublished details about the anniversary model "30 years 911" (M-code 096). The anniversary model "30 years 911" (M-code 096) was mainly sold in viola-metallic paint with rubicon-colored interior. Other series colors were amethyst-perlcolor and polar silver-metallic. Here both rubicon colored, and black interior came to delivery. With the latter variation without the leathered air bag and without rubicon-grey figure sheets in the round instruments. A very small number of anniversary models were also manufactured in other colors of paint. The colors black and red are currently assignable. The vast majority of the vehicles was for the German market, so with Country equipment- code C00 (Country equipment Germany). It concerns, on this occasion, at least 531 vehicles. The anniversary model "30 years 911" (M-code 096) was not offered for the North and South American market. The anniversary model "30 years 911" (M-code 096) is essentially a regular 964 Carrera 4, upgraded through the body of the Turbo, with its flared front and rear fenders and wider bumpers. To not have to use spacers , like earlier Turbo-Look´s did, the rear-axes and wheel carrier from the 3,3 Turbo were used. The adjustable shock including the shock absorber, corresponds to that of the regular Carrera 4. For the USA a cabriolet from the MY 1984 with I491 exists. The other ones which do not have the option, but carry all insignia of the original Turbo-Look, are documented in the register. Same is valid for the RoW vehicles of this model year. It is likely that these cars originated by Z application in the special wish department in the Werk1, because all known cars have noted Z applications in their birth certificates. 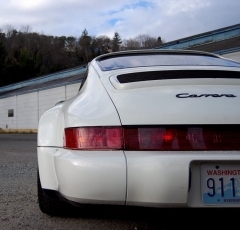 The Standard C4 were so equipped (somewhat firmer construed as the Carrera 2). Springs with three oranges points were installed for the rear (964 333 531 04 504). The stabilizer for front was 21 mm, the rear 22 mm as in the Turbo. The rear calipers correspond to the caliper of the Turbo 3.3, mounted on the semi-axes of the Turbos. However, the piston used in the saddle corresponding to the regular Carrera. 4 The brake discs were also identical with the series Carrera 4. Because the front standard C4 calipers and slithers were mounted, one also used a weaker 33-bar valve to compensate for the brake balance. 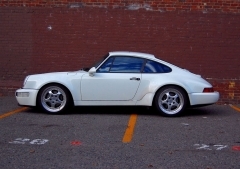 As opposed to the Turbo the anniversary model "30 years 911" (M-code 096) lacks the big rear wing. It has the automatically extending Carrera 2/4 back spoiler. Standard wheels and standard tires for all described variations are: 7 und 9 J x 17 ET 55 alloy wheel in Cup I-Design with 205/50 ZR 17 and 255/40 ZR 17 tires – often chosen from Pirelli, Continental, Bridgestone or Michelin. In the basic equipment part-electric seats, electric window lifters, electrically adjustable outside mirrors, two air bags, as well as a Rubicon-grey or black whole leather equipment provide in the interior for the welfare of the passengers. For England, Australia and Hong Kong it was offered only of the Driver airbag. The figure sheets of the instruments are also held in Rubicon grey, provided that the interior equipment is not black. Against multiple wrong publications were neither radio with cassette or CD-Changer, automatic air-conditioning, Onboard computer, sunroof, Raffled leather equipment, sport seats nor phone preparation and 92 liter fuel tank serially, but stood on the additional equipment list! Many many more features and more individual codes were assigned, the listing would be beyond any scope. 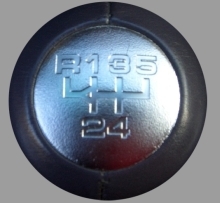 In the switch handle of every jubilee model „30 years 911“ (M-code M096) an aluminized badge is let, witch illustrates the switch pattern of the five-speed gearbox. Embroidered on the backs of the folding rear seats, is the lettering 911 in the font type of the early years. Centered on the parcel shelf is attached a leathered block to accommodate two aluminized badges on front and rear. 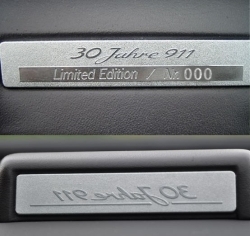 The externally badge, visible through the rear window, shows the individual serial number of the limited-edition model. 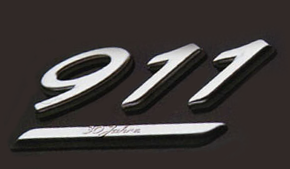 Directed into the interior plaque features the following inscription "30 years 911" in mirror writing, so that the driver has when looking in the rearview mirror the peculiarity of his vehicle always in mind. The rear lid has a simple 911 silver lettering in the style of the first Porsche models, the underscore with the inscription "30 years" provided. As described in advance, there are up to the missing limitation and a few different interior details, no significant differences to the anniversary model "30 years 911" (M-code M096). Of course, lacking any special insignia such as badges, embroidery, and instrumentation. The crucial distinguishing feature is the lack of limitation. Contemporary witness report that was mentioned by sellers only in passing, that those who had opted for a color according to his wishes, no limit on number would receive. The US - Version : Carrera 4 Wide-Body "30 Years of Excellence"
Technically there is really no difference between the Carrera 4 Wide-Body and his RoW counterpart. At the front there are the for America usual black impact absorbers beside the fog lights, the frontfenders lack the side indicators, the rear bumper is equipped with the center piece with a small plate section and in the back window of a large third brake light is integrated. The customer found other extra equipment all over on the extra equipment lists. Many vehicles were individualized, in addition and revalued. The non-official naming as "USA-Jubi" meets the intention of Porsche which led to the market launch of the Carrera 4 Wide-Body for the North American market, at least partially. Porsche 911 was presented in 1964 for the first time in America, and consequently the model year 1994 was planned for the introduction of the Carrera 4 Wide-Body. On the showroom poster and in the prospectus this was manifested by the pictures of an early 911 of 1964 and the new C4 Wide-Body in the same colour. However, the exposition car for America was held in uni-black and was equipped with a tan coloured interior equipment with black belt line. 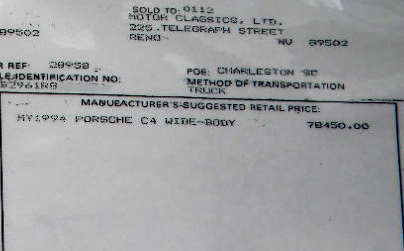 All cars, whose internal code is 964150 in Porsche, like with the counterparts for RoW, received quite early the chassis numbers intended for model year 1994 (R-series) , but really the first cars were on the move already in March, 1993 on US-American streets. In this subject correctly expressed: The first 137 cars were assigned with the option M718 of the Numeric for model year 1994. 130 other ones were really made in model year 1994 and dont use code M718. So all cars have chassis numbers of the model year 994 = WP0AB296(#)RS420061 to WP0AB296(#)RS420456. It can be assumed without malice that Porsche rather made a marketing oriented move. Although they applied the model with the attribute "30 Years of Excellence", but as the Carrera 4 Turbo-Look Coupé (without M096) neither limitation nor special features and coloring were provided. The real reason for presenting this very special car, but may be seen in the fact that for capacity reasons, the launch of the successor model Porsche 993 in the U.S. until spring 1994 (model year 1995) had been possible. In order to bridge the half year after the plant shutdown in the summer of 1993 without the need to offer "old stuff" , it needed something no one ever seen before. The 964 Speedster was a fixed size, and also the recently introduced turbo 3.6 caused a lot of attention. The "normal buyers", mentioned in the prospectus with the safety-oriented disposition of the Carrera 4, should also not be neglected. The spectacular appearance of a widened 964 was just right in time, and in retrospect this should probably be viewed as the main intention for the launch of the Wide-Body C4. 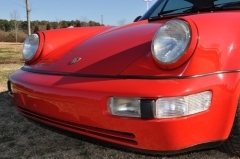 The weakness of the dollar in 1993 made German cars more expensive in the U.S. considerably, and the U.S. sales for Porsche in model year 1993 was below average. Also in the model year 1994 one succeeded in setting down just another 396 Carreras Coupés for North America. 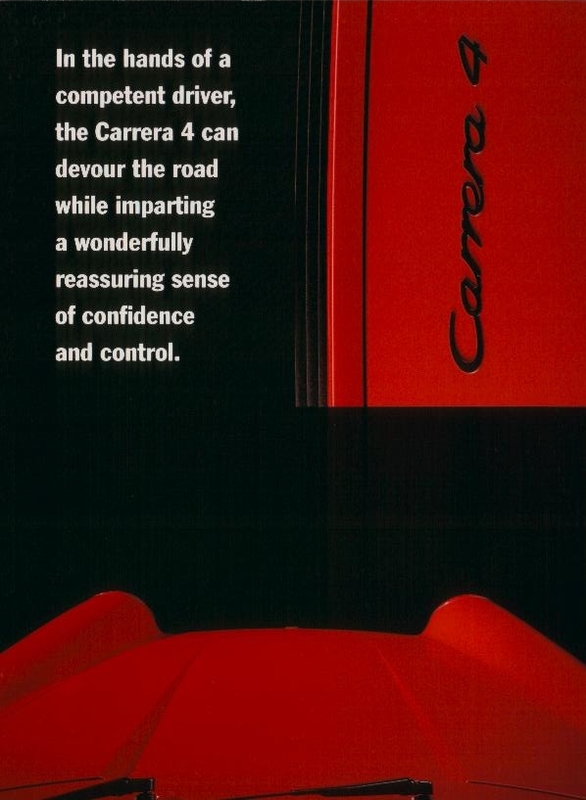 267 pieces of them were sold as Carrera 4 Wide-Body "30 Years of Excellence". The base price was 78.450,- Dollar. No sales prospectus and no price-list for the individually orderable Carrera 4 Turbo-Look coupé is known . For America exists a sales prospectus. A poster exists in America with 901 and 964 C4 TL in Red. 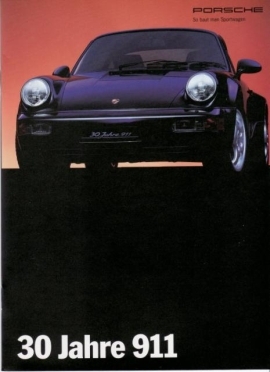 The official showroom poster for the introduction of the "USA-Jubi" of Porsche in the USA. 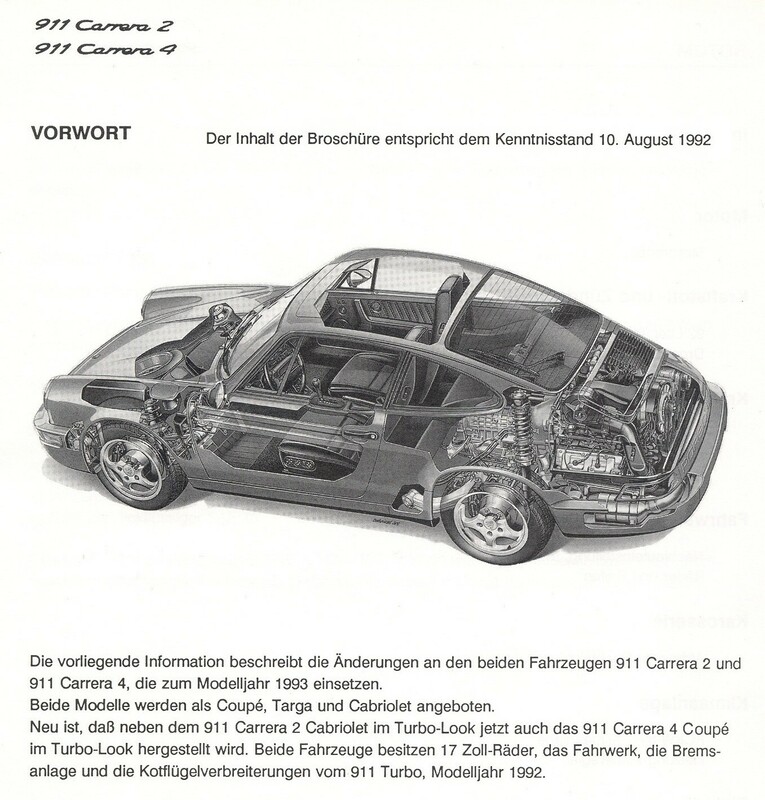 No mention of the individually orderable Carrera 4 Turbo- Look coupé exists in the normal prospectuses / price-lists model year 93 / 94 (for 964 only 1.8.92 and 1.1.93). No price-list is known to the Jubi prospectus. The type price-list "model year 93 (!) to 1.6.93 (!)" mentions "Carrera 4 Coupé Turbo-Look" as own entity (there seems to be comparably also no retail price list to the Turbo 3.6 with base price 207,880 DM) the convertible WTL was present against it with standard status everywhere. 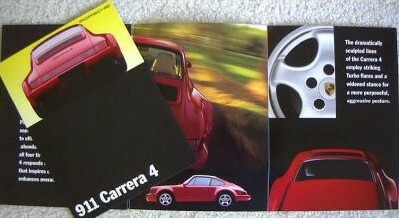 The price-list, to 911-968-928 folders attached and probably also to other material added, mentions the Carrera 4 Turbo-Look jubilee model. There it is priced with 145,900 DM. To many models of Porsche 911 entwined stories and myths. As also and especially the special model 964 Carrera 4 Turbo-Look makes no exception. Who has come up here has not difficulty to notice that the complex interrelationships to clarify error-free is not so easy. Previous attempts, usually without such detailed background knowledge have led to adventurous attempts at explanation. Many of such scattered rumors and half-truths have such manifest that this whole lines of evidence were constructed, yes even have found their way into the official language regime at Porsche. Numbers of pieces: 911 anniversary models were manufactured. The crucial misinformation on all previously published figures and statements is based, that there are 911 anniversary models. Obviously this is not the case. However, I would like to point out again here that the Turbo-Look Register refers to the official Porsche agenda. The existence of at least two "Jubis" without M096 is already proven. So no obstacle either that there may be additional. Of the 15 silver Carrera 4 Turbo-Look (without M096) is so far not a single car in reality detected what is quite unusual. Whether there the lack of anniversary models are to be found? Unfortunately, the various contact persons at Porsche AG are willing to give any help and punish all inquiries with strict ignorance. All Carrera 4 Turbo-Look are anniversary models. This thesis used by an increasing number of Porsche Centres in advertisements must be clearly rejected. The total number of pieces, equipment and any documentation from the time disagree. Turbo look like Turbo-Look models to MY 1993. The myth Turbo-Look has always led from ignorance to wild speculation, but existed even at Porsche no detailed documentation for these cars. In fact, they had reinterpreted the Turbo-Look in "Wide Body" in the latter model and rationalized essential, so far included equipment. However, the consequence in Porsche is unequivocal, because the model 993S was not any more equipped with the option code M491. Here one awarded, to end up the confusion for all times an own option code. The Carrera 4 Turbo-Look coupé is equipped like a Carrera 2 cabriolet Turbo-Look. From Porsche as a luxury cabriolet with absolute full equipment launched Carrera 2 cabriolet Turbo-Look, is equated on account of the name addition in many publications with the Carrera 4 Turbo-Look coupé. Really, however, the Carrera 4 Turbo-Look coupé was equipped purely specifically for any market, in the standard equipment mostly rather spartan.. In fact, Constantine II. of Greece was initially emigrated after an amateurishly executed counter-coup against the military government from in his homeland to Rome and then lived in the '90s in London, England. 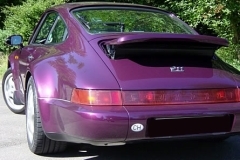 Although he was able to briefly return to his homeland in 1993, he ordered yet is one of three right-hand drive Carrera 4 Turbo-Look Coupé (without Option M096) coulored in Oakgreen metallic (picture shoes the original car) with champagne interior. However, this delivered by AFN Limited cars, is a car from the model year 1993 and placed on the market on 13.09.1993, so by no means to the end of production. 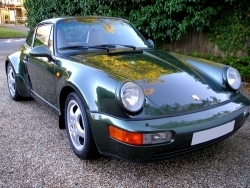 The last produced Carrera 4 Turbo-Look Coupe (ohne M096)was tannengruen-metallic (forest-green-metallic). A good example of how the fusion of individual theses leads to new "stories". The "King Story" has already made it in many books, but still remains wrong! Unsold Turbo body´s were the reason to introduce the Carrera 4 Turbo-Look. In many publications throughout the world, always a collapse in production of the top model Turbo, with the result that thousands of Turbo body´s left unused, is responsible for the existence of the Carrera 4 Turbo-Look. This mantra repeated claim is also used for the existence of the 1989 Speedsters, what is even more absurd. The nearly fully developed four-door coupé project 989 was just, after having already invested nearly a billion DM, rejected for cost reasons. 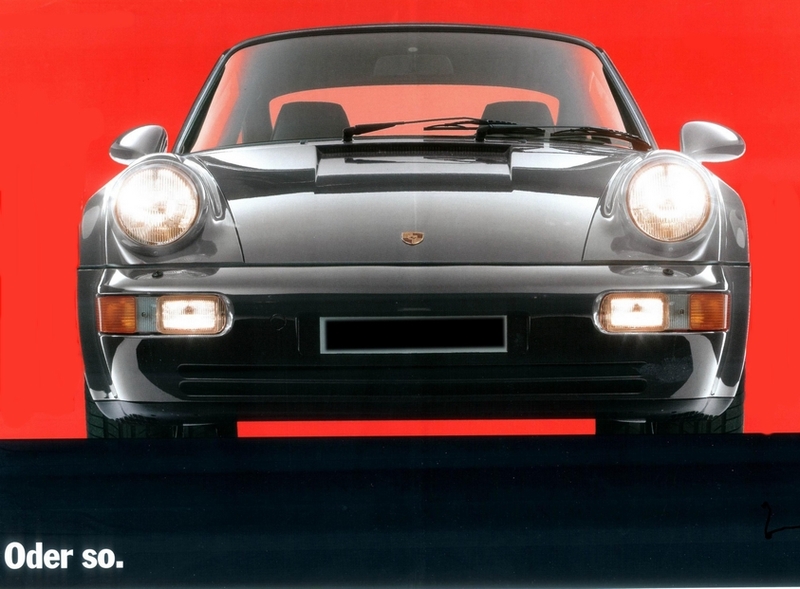 The sales figures of the 964 ran especially in the export rather descending. With an expected record loss this fiscal year Zuffenhausen stood close to insolvency and it was speculated openly about the adoption of the previously independent company. One can imagine that Porsche was not able to create a production surplus (in spite of staff reductions and construction contract for the Mercedes 500E), pay for the production surplus (of what money?) and above all store all that body´s. At what place they could have done such a thing? It is a fact, such a bearing and over-production of cars has never been at Porsche. "Just in Time" even Henry Ford has produced his cars. Predict a modern enterprise for such backwardness is abstruse, particularly against the background, that from 1.10.91 Wendelin Wiedeking was production manager, so surely built up pressure on this sector to be more rational. Maximum PRM U/Min 6720 max. Acceleration: 0 auf 60 mph. in 5,5 Sek. 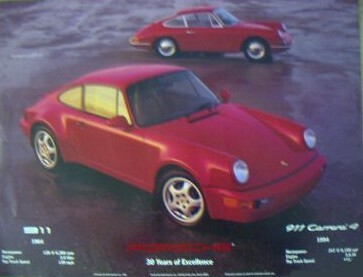 The jubilee model "30 year 911" and the Carrera 4 Turbo-Look coupé were in my opinion though no niche products, nevertheless, they put out about one third the whole coupé production. However, they were not pursued by Porsche with verve and the necessary application, before the background of the 993-introduction deciding everything, and were promoted badly. (e.g., only two mentions in the Christophorus, missing catalogues and price-lists, insufficient shop assistant's training). 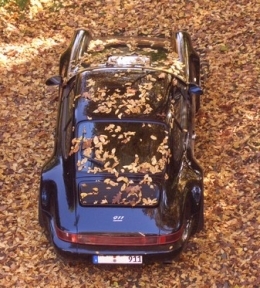 The 964 was dragged even further in the Indian summer in 1993 , every sold car counted, but without big ambition. Special models should increase the broken sales figures. Exactly this fact makes these cars today and certainly also in future for collectors and enthusiasts exceptionally interesting. 964 C4 Turbo-Look coupé and the jubilee model "30 years 911" are currently the last standard vehicles in the classical design of Porsche which carry the m code 491 in her birth certificates. However, on the option sticker under the front bonnet and in the warranty voucher it is not performed. Of my knowledge the final point of the 964th class was given, by the way, by the technical details of the transport bridge about the Schwieberdinger street which became effective at the end of 1993. Otherwise one may certainly say that the Porsche history of these years permits almost every speculation because in the absence of documents also the biggest nonsense is hardly to be disproved: logical conclusions remained up to now always without sturdy proofs.